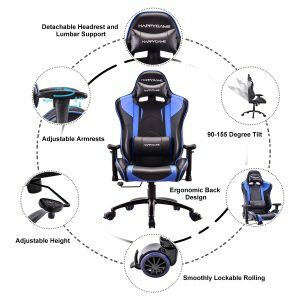 HappyGame Racing Gaming Chair (AS-02-Blue-1) is very large and comfortable with and ergonomic design, a high back, a lumbar support and an adjustable headrest for gaming, office, computer or desk chair. With this racing design chair that offers plenty of support your whole gaming experience will be enhanced. You’ll feel very comfortable on this chair when you’re working at your desk on your computer, playing games or just relaxing. Both the padded headrest and lumbar cushions that you put on the large and high backrest are removable. And your back including your spine and neck are supported properly. 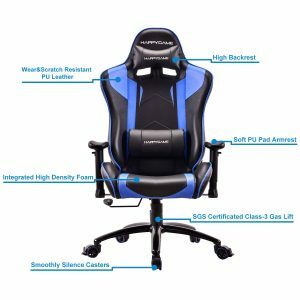 Almost all parts of this great racing gaming chair are actually adjustable, so that it fits your height and body type nicely. The back pressure, the backrest tilt, the armrests and chair height can all be adjusted. You can even lock the wheels underneath for better support and stability. You can adjust the backrest angle between 90 and 155 degrees with the tilt locking mechanism. 90 degrees angle of the backrest is for working, 100 degrees is for gaming, 120 degrees is for reading and 155 degrees is for resting. You can adjust the armrests left and right, up and down (two dimensions) very easily. It feels very safe and stable when you’re sitting on it, with a heavy duty sturdy metal base on smoothly rolling wheels, built-in metal frame and global standard explosion-proof gas spring cylinder that is height-adjustable. The premium PU leather used on this solid chair is resistant to wear and tear, is easy to wipe clean on a daily basis and shall last longer. It can carry a maximum user weight of 400 pounds. The HappyGame Racing Chair looks modern and is easy non the eyes, weighs 52.9 pounds and measures 27.2W x 21.7D x 48.8- 52H inches, with the seat measurements of 15.7 x 20.5 inches and the backrest of 24 x 33.1 inches. Please note that this chair spins around as much as you like. The chair has a sturdy and durable construction with a solid steel frame and a very dense resilience foam, and it shall hold up well over the years. If you’ll be using it with a shorter desk you can certainly remove the armrests. It gives you a great deal of flexibility overall. With all the features, flexibility and robust construction the price of this chair is quite reasonable and you seem to get more than what you pay for. It is easy to put together within an hour or so with the tools and instructions included in the box. You’ll get a one-year limited warranty, satisfaction guarantee and great customer support after the sale. You can contact them directly via phone or email if you’re not dissatisfied for whatever reason. Overall you’re getting great value for the dollar.